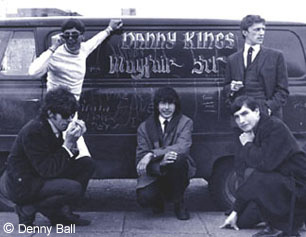 Well-known Birmingham vocalist Danny King (see Danny King) put together a new backing group called "The Jesters" in 1965. The line-up included guitarist Trevor Burton and drummer Keith Smart, both from Aston as well as bass guitarist Peter Allen and organist Roger Roger Harris from The Conchords. Trevor Burton was born Trevor Ireson on March 9, 1949 and lived in Whitehouse Street, Aston. He started singing rock 'n' roll songs and playing guitar at an early age. Trevor was leading his own young group called "The Everglades" by 1963 although at that time he was still a student at Upper Thomas Street School. Also in The Everglades was Trevor's school friend Keith Smart. The Jesters were managed by promoters John Parsons and John Sabel of "Mayfair Entertainments". They had the idea to re-name the group as "The Mayfair Set" which included a suitably posh new image to include top hats complete with capes and canes that the band wore for their first gig at The Belfry in Wishaw. Pete Allen left the group to be replaced by bass guitarist Dennis "Denny" Ball. Denny came from Sutton Coldfield and had grown up in a musical family. His brother Pete played keyboard in The Sorcerers who had legendary drummer "Cozy" Powell. Another brother Dave was guitarist in a band called The Madding Crowd. Danny King still retained a recording contract with Columbia Records and his next single recorded with the Mayfair Set and entitled 'Pretty Things', was released in January 1965. The record credited to "Danny King" was produced by Norrie Paramor and may have featured Roy Wood from Mike Sheridan's Nightriders on session guitar. A follow-up 45 was credited to "Danny King's Mayfair Set". The A-side was titled 'Amen (My Teenage Prayer)' and had Danny King credited as the composer. Despite gaining the band some local attention, neither of these records managed to gain a chart placing. Danny King also wrote and recorded a duet with Carl Wayne of The Vikings titled 'This Is Love'. Danny King left The Mayfair Set in January 1966 to become involved with a new group project (see Locomotive). Trevor Burton had also departed a month earlier to become a founding member of The Move resulting in that particular Mayfair Set line-up disbanding soon after. Keith Smart was to join a new recording group in 1967 called The Lemon Tree who had their first single produced by Keith's former band-mate Trevor Burton. Keith would later play drums for The Uglys and Mongrel before finally making the big time when that latter group became the foundation for Roy Wood's chart-topping band "Wizzard". A new "Mayfair Set" re-grouped in 1966 after Danny King and Trevor Burton left. The line-up was remaining original member Denny Ball along with Chris Evans and Jim Murphy (both guitar and vocals), and Dave Reay (drums). They went over to Germany for a year where they recorded a couple of singles that were issued there on one of the local labels. This line-up of The Mayfair Set disbanded by the end of 1967 following their return from Germany. Denny Ball joined his brother Dave from The Madding Crowd to form a new blues-based line-up called Chicago Hush. Denny and Dave later went on to join drummer Cozy Powell in the Ace Kefford Stand in 1968 before forming the acclaimed hard-rock trio 'Bedlam'. Dave was also to play guitar as a member of the internationally successful band Procol Harum and is featured on their big hit single 'Conquistador' taken from their album recorded live with the Edmonton Symphony Orchestra. As for Danny King, he continued to perform and record occasionally throughout the later 1960s. He remains to this day as one of the most respected and admired Birmingham vocalists from that era.